Washington, Feb 7 (IANS) Tulsi Gabbard, the first Hindu US Congresswoman and Democratic presidential candidate, has said that Syrian President Bashar al-Assad, who has been accused of using chemical weapons to attack civilians in his country’s years-long civil war, is not the enemy of the US. "Assad is not the enemy of the US because Syria does not pose a direct threat to the US," Gabbard said on MSNBC on Wednesday. She met Assad in Syria two years ago, saying at the time she "felt that it’s important that if we profess to truly care about the Syrian people, about their suffering, then we’ve got to be able to meet with anyone that we need to if there is a possibility that we can achieve peace". 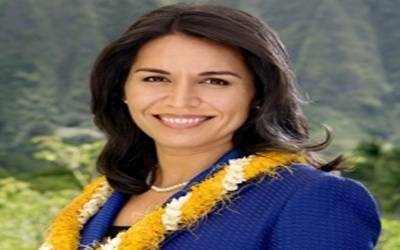 Asked if she viewed Assad as an "adversary" of the US, Gabbard demurred and said it was important to look at who posed a threat to the US and how the interests of other nations compare to those of Washington. Pressed on the point, she said: "You can describe it however you want to describe it." Asked later in the interview if she thought Assad was a good person, Gabbard said, "No, I don’t," and asked if Russian President Vladimir Putin was an adversary to the US, she responded: "Yes." Gabbard said she did not want US troops in Syria and that she was not interested in regime change and nation-building on the model of US efforts in Iraq or Afghanistan. She also voiced scepticism about the Assad regime’s widely reported and confirmed use of chemical weapons against its own people. Her appearance on MSNBC came after she brought a Syrian Kurdish leader to President Donald Trump’s State of the Union address Tuesday night. Gabbard said they discussed her meeting with Assad and stressed the importance of meeting "adversaries or potential adversaries, not just our friends, if we are serious about the pursuit of peace". Earlier she drew a comparison between her meeting with Assad to Trump’s summit with North Korean leader Kim Jong-un in 2018. Later on Wednesday, Gabbard tweeted that "warmongers" were wrong to label her as a "’cozy’ with evil regimes". "We heard attacks from warmongers in politics/media before. Those opposed to Iraq/Libya/Syria regime change wars are called "dicatator-lovers" or "cozy" with evil regimes. Rather than defend their position, they resort to name-calling & smears. American people wont fall for this," she said.